Duodenocolic fistula (DCF) is a rare disorder defined by the presence of an internal fistula between the duodenum and colon. Colon cancer, Crohn’s disease, diverticulum and duodenal ulcer are common causes of DCF, and vomiting and diarrhea are its main symptoms. We report a 14-year-old boy with DCF who had been treated for a functional gastrointestinal disorder (FGID). The boy had often experienced episodes of vomiting and diarrhea since infancy, and had been diagnosed with FGID. He was referred to our hospital because of a 2-month exacerbation of persistent vomiting and diarrhea. Upper gastrointestinal contrast revealed no abnormalities. Eventually, esophagogastroduodenoscopy detected a duodenal fistula, and DCF was diagnosed by endoscopic fistulography. Colonoscopy showed a diverticulum in the ascending colon near the fistula. 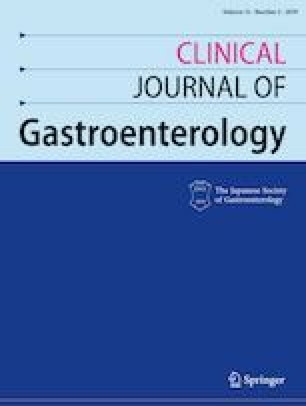 In addition, a C13 urea breath test for Helicobacter pylori infection was positive. One hypothetical pathogenesis of his DCF was perforated colonic diverticulitis. Adhesion between the fistula wall and colonic diverticulum near the fistula strongly suggested a relationship between the fistula and the diverticulum. However, he never presented with symptoms of colonic diverticulitis. Thus, a congenital origin was also suspected. After confirming temporary relief from the symptoms by endoscopic closure, surgical closure was performed. All the authors declare no conflicts of interest in association with the present study. All the procedures followed were performed in accordance with the ethical standards laid down in the 1964 Declaration of Helsinki and its later amendments. Informed consent was obtained from the patient and his mother for inclusion in this study.